My mother once told me, ‘Life has its way of throwing us down. It is absolutely upon us whether we want to get back up or not. And we must choose a way to get back up, face the challenges in life and move ahead’. And when I find myself in such a situation, I always look upon my Amma for what she might have done if she has to face such a situation. And it always worked wonders for me. It is mother’s day today. Though I feel such days are just made by us, the people, and I strongly believe that, just celebrating one day in a year as mother’s day is not enough for all the sacrifices that mother’s have gone through in life, just to make the life of their children happy. My Ma, held me tightly, and tells me, she is proud of me, she loves me and she tells me always. I am so lucky for this fact, as I don’t have to question her love or her pride for me, because it is a bond she has lovingly strewn throughout my life. I am grateful for that. I am happy to have her, happy to hear her. Being able to enjoy my mother’s company, have her present with me, hold interesting and substance-full conversations with her on any or every topic under the sun, knowing her opinion and her feelings on anything which my heart desires and most of all, spending time with my Amma are extremely special. This world is amazing. With my Ma, the world and my life are even more wonderful. Everyday my mind is blown away by the complex and extraordinarily beautiful experiences I am whisked through. Those moments, spending time with my mother are extremely special. Just my sister, I and our mother at our home, standing, breathing the fresh air, grass under our feet, sun shining down on us, eyes wide open taking for granted everything around us, each grass strand so beautiful, each soil particle so complexly made, yet so simple enough to understand that we don’t even think about how it came to be. The bond that I have with my Amma is one which I treasure a lot. Often words get exchanged, conversations made and emotions felt between us. The whole experience is by itself truly makes me feel happy and contended. Though these words and conversations were made smoothly with my Ma, but at times we do get fight over petty issues, and at the end of the day, we stick together, with doubly charged up emotions. And definitely, just us in the kitchen, chatting, discussing about studies or my work with my Amma cutting the vegetables, cooking, breathing the fragrant curries that she makes daily, those are the moments mostly cherished by me. I wanted to cook something for my mother as a token of love. My Amma loves One pot meals, especially Indian dishes a lot. So I decided that I will make Channa Pulao. To go with it, I made some Raita which my mom relished to hearts’ content. Soak channa the previous night or for at least 8 hrs or better still, overnight. 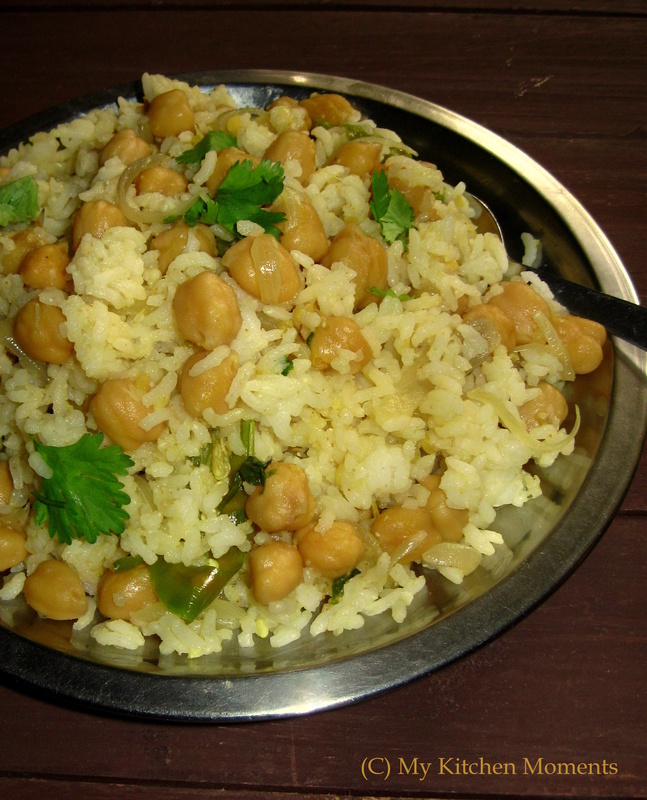 Pressure cook channa for 5-6 whistles without salt and required water. Set aside. Soak rice in water for 30 mins before cooking. Set aside. Slice onion length wise and slit green chillies. Heat a pan with coconut oil and temper with the items listed under ‘To Temper’ table. Add onion, green chillies and fry till transparent. Add ginger garlic paste and fry till the raw smell goes away, but make sure not to over fry or burn it. Add channa masala powder and give it a stir. Then add the channa and rice drained from water and add salt. Mix well. Add 3 cups of water, close the lid, and bring to boil. Keep in lowest possible flame and cook for 12-14 minutes. Once done, switch off. Later, open the lid, if need be, add ghee, fluff it up, garnish with coriander leaves. 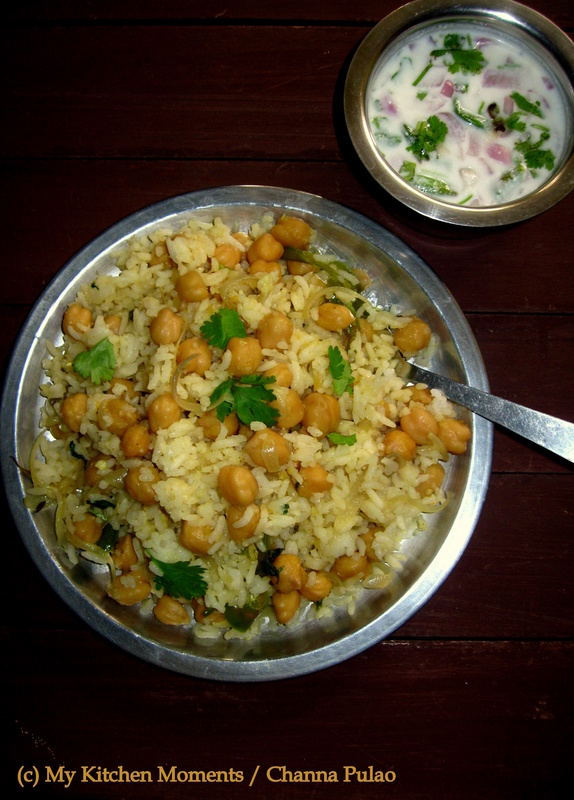 Serve Channa pulao warm with Onion Raita. You can even add mint leaves for extra flavour. You can make in pressure cooker too giving 2 whistles in low medium flame. Water is 1.5 cups if you have pre-soaked the rice for 30 mins. You can even add 1/2 cup coconut milk and add 1 and 1/2 cups water in total. 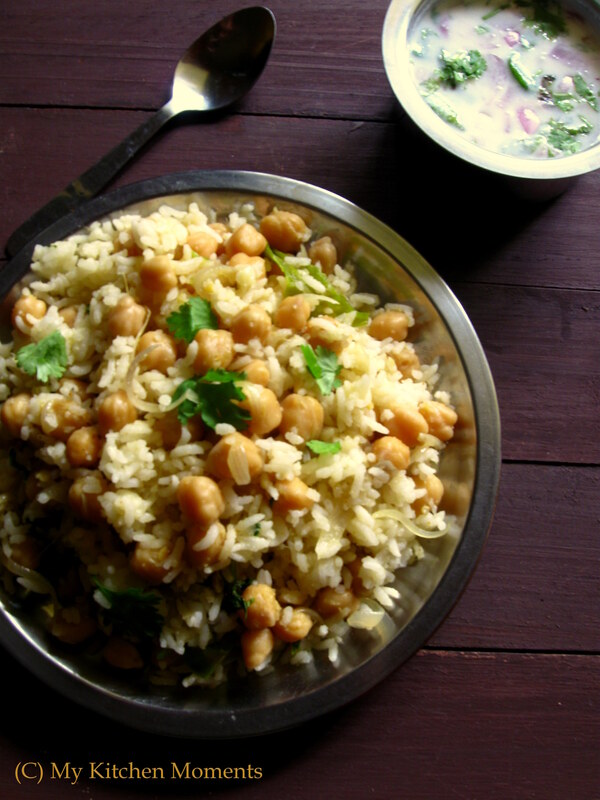 I love chickpeas and I love pulao. Put together, they are just a winner!